The Nigerian Senate has cancelled its scheduled resumption for Tuesday, 29th January, 2019.The Clerk of the Senate, Mr. Nelson Ayewoh, stated this in a statement signed by him on Monday evening. “This is to inform all Distinguished Senators of the National Assembly of the Federal Republic of Nigeria that the resumption in Plenary scheduled for tomorrow, Tuesday, 29th January 2019 has been cancelled. The Senate did not state the reason for the cancellation. Sources claim the cancellation was due to plans by the Senate to make further clarifications from the Supreme Court if President Muhammadu Buhari acted within his powers by suspending the Justice Onnoghen. 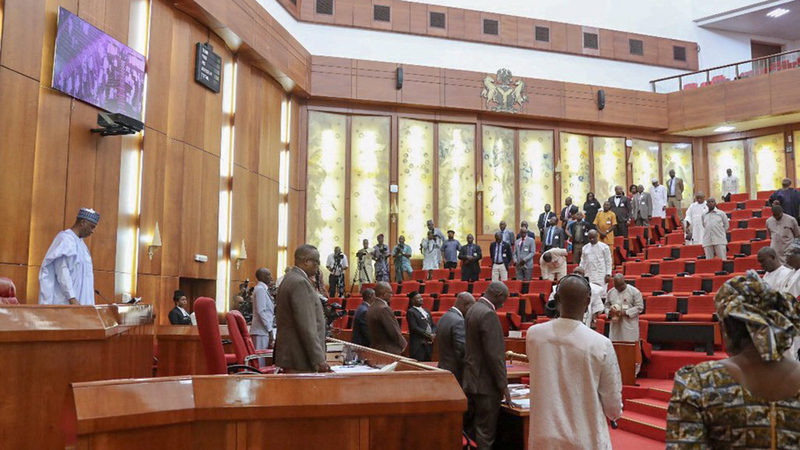 The Senate had decided to reconvene on Tuesday following the suspension of the Chief Justice of Nigeria Justice Walter Onnoghen by President Muhammadu Buhari on Friday. Senate President Bukola Saraki called the suspension of Justice Onnoghena coup against democracy. He said the unilateral suspension of the CJN by the president without following the provision of the constitution, amounted to gross misconduct.